It is distant. It is alluring. It seems closed and inaccessible. Pop culture has romanticized it and kindled the spirit of curiosity among those of us who thirst to know more about it. Its absolute unwillingness to open itself up to foreigners until the late 1950s did nothing to reduce its appeal to those determined to get there, as a certain Herr Harrer (as played by Brad Pitt in Seven Years in Tibet) would have you know. It has seen the “Great Leap Forward" and the Cultural Revolution. Images of an unvisited Lhasa and its moonlit alleys with gentle sloping roofs below the awe-inspiring visage of the Potala Palace have now been erased. All one can now imagine and see are aesthetically revolting blown-up images of Chairman Mao Zedong in a Tibet that seems less enticing for a traveller with each passing day. Thankfully, there are places within India that still embody what Tibet once used to be. McLeodganj in Himachal Pradesh and Bylakuppe in Karnataka satiate those who want to connect with Tibetan Buddhism, revel in His Holiness’ aura or explore exotic locations that are both Indian and foreign at once. McLeodganj is not your typical weekend getaway from Delhi or Chandigarh, for it takes more than an overnight journey to get there. On the bright side, only during long weekends or the holiday season does the place get annoyingly touristy. On most other occasions, the average point-and-shoot camera-toting, noisy, city-bred boorish visitor is nowhere to be seen. Instead, the streets of McLeodganj are frequented by travellers with an objective beyond casual discovery. McLeodganj (also known as upper Dharamsala) was ravaged by the Kangra earthquake in 1905 and abandoned shortly thereafter. It was given a new lease of life in 1959, with the setting up of the Tibetan government-in-exile. 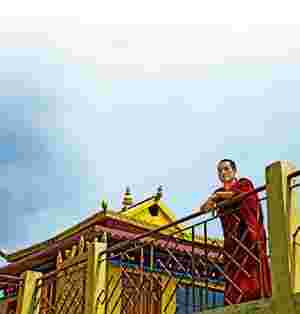 Where Tibet is free: A monk looks out from Nechung Monastery in Dharamsala. Photograph by Divya Babu/Mint. My first day was spent around the town’s central square. It’s a good idea to use the square to orient yourself, since it is almost mid-point for all places to visit and things to do. A simple walk in the heart of town along Temple Road and Jogibara Road lent itself to many interesting sights, sounds and smells. These two roads run in parallel from the square and house popular hotels, stores, restaurants, cafés and souvenir shops, in addition to street hawkers that sell steamed momos and other items. The other items may range from kitsch jewellery to posters of His Holiness to DVDs of Kundun and Seven Years in Tibet, but the momos are a constant. The Namgyal stupa is located between these two streets and serves as a thoroughfare between them. The prayer wheels that surround the stupa are rotated continuously by those looking to accumulate good prayer karma with minimal effort. People circumambulate the stupa at all times of the day. Walking back to my hotel a little after midnight one evening, I witnessed a frail, old woman praying at the stupa. She was turning the prayer wheels with her right hand while softly chanting mantras that were audible only because there was no sound on the street at that time of night. Another pleasant walk on a street filled with souvenir shops, clothes stores and more roadside momo stalls took me towards the Tsuglakhang (Main Temple) Complex. I’ve never seen a greater variety of “Free Tibet" paraphernalia before, some sadly trivializing the cause. The winding road slopes down towards the complex and the Namgyal Monastery. Unlike most other crowded religious places where it’s increasingly tough to seek mental serenity, the sonorous prayer chants of the monks at the monastery, combined with the peaceful surroundings and great views, had an incredibly calming effect on me. More prayer wheels, the familiar essence of lighted yak butter lamps and people-watching at the beautiful temple complex made time fly. Before I knew it, I had already been there 5 hours, appropriately enough with Pico Iyer’s The Open Road to keep me company. Sitting on a park bench in the area between the temple and the monastery, I learnt of an interesting debating ritual among monks that helps reinforce the teachings of the Buddha. One monk sits calmly on the ground, answering questions that another monk throws at him while towering over him, clapping hard and stomping his foot in an attempt to break the examinee’s concentration. I was informed that this animated, emphatic series of gestures is a way of having a lively debate while ensuring that despite distractions, the lessons have been well learnt. The Buddha’s teachings also have an unexpected benefit: Stray dogs in McLeodganj are healthy, friendly and seldom ill-treated. They are considered reincarnated monks that had left the fold, only to be reborn as dogs that wish to atone for their desertion. The Dalai Lama lives in a small residence within the complex. I hung around to get a glimpse of His Holiness, but was informed that such chance encounters are had only by a few lucky souls nowadays. The Bhagsunath temple, on a long and winding road away from the central square, is one of the few temples in India where you can find an idol of the Hindu god Shiva instead of a shivling in the inner sanctum. The splendid view of the lower Himalayas and the majestic Bhagsu waterfall were ample incentive to undertake this walk, which took me around 5 hours at a slow pace. Another pleasant walk, in the opposite direction from the temple, is the 159-year-old church of St John in the Wilderness. Situated on the main road en route to Dharamsala, this Gothic-style architecture church has beautiful stained-glass windows of St John baptizing Jesus. The church isn’t visible clearly on the approach road, so few tourists stop here, keeping it serene. Free from party animals who frequent hills, McLeodganj offers salubrious climes, magnificent vistas, and spiritually invigorating moments. Here, the holiday getaway is richer than the sum of its individual experiences.